One of the first objections anyone seems to have with getting a Chromebook is that their familiar applications won't work on the browser-based operating system. This is understandable, because a sense of familiarity is always key when choosing anything new, but taking just a few minutes to learn the basics of a new app can not only expand your horizons, but also offer you a ton in both time and money savings. Granted, not a lot of the high-end professional applications have a web parallel, but in this post I'll show you exactly how close to professional you can actually get without spending a dime. The first and most obvious application is actually a bundle of applications: Microsoft Office. I won't spend a whole lot of time here, because Google's office suite is well-known as a replacement for Microsoft Office. What you may not know is that a recent update to Google Drive allows you to open and edit Microsoft Word, Excel, and Powerpoint files natively, so there's absolutely no reason you should have to hold fast to the old gods. Here is a list of parallels and just a few tips for each one. Word → Docs: Google Docs is the premiere Web app for word processing and, in my opinion, even exceeds Word. There may be some obscure features from Word that you'll miss in Docs, but the collaboration and sharing features more than make up for it. I also especially like the ability to print to FedEx Office. You don't even need your own printer anymore. Excel → Sheets: Sheets has basically everything you'll want in a spreadsheet app, if you want a spreadsheet app. Personally, I don't use it that often, but it's my understanding that there's nothing you want to do in Excel that can't be done in Sheets. Powerpoint → Slides: If you're looking to make a presentation, Slides is the app for you! One awesome feature you might not be aware of is that the presentations come with the ability to cast to your Chromecast device, so there's no reason to screw around with wires hooking up to a projector. Outlook → Gmail: Of course, Gmail is an awesome e-mail service, but you may not know that it can also retrieve your work e-mail. I just recently set up the POP server settings to my work e-mail and now I get all my mail in one inbox, but my work e-mail is tagged with a label named for my company for easy access and segregation. Calendar → Calendar: Microsoft's Calendar is technically part of Outlook, but in the world of Google it's another site altogether. In any case, you're probably more aware of Google's Calendar than Microsoft's, so I won't bother to dwell here. Paint → Drawings: Okay, so, Paint isn't technically part of the Microsoft Office suite, but you should know that it is another Microsoft staple that has a parallel in the Googlesphere. Drawings might take a little bit of getting used to because the "Scribble" feature, which is basically Paint's "paintbrush," works a little differently, but since it's there, I don't think you'll miss Paint. Speaking of Paint, you might have been looking for a free alternative to Adobe's famous photo-editing application, anyway. That's one expensive piece of software, and it's quite frequently the target of pirating because of it. Well, search no more, Chromebookers, because Pixlr is here for you! With its familiar interface, you won't miss that other application... except when you want to add a stroke effect to a layer. Okay, so there are a few features missing from this, but a creative person will find a way around that. For example, instead of using a stroke effect, you might use an outer glow effect, make it black, and set hardness to 100%. 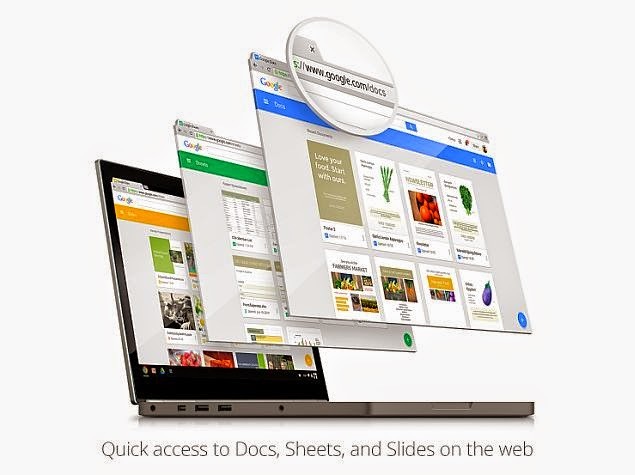 The important thing is that it's absolutely free and it works with Google Drive, which, as I've noted before, is baked natively into your Chromebook. Or Windows Media Player or Winamp or whatever other music player you use. There's a couple of things here. First of all, Chrome OS will automatically play audio files in a stand-alone feature. But if you really wanna listen to a whole world of Music at your fingertips, you can use Google Play Music. You can upload your own stuff, or buy some new stuff, or subscribe monthly to listen to everything they have available. They've also got genre radio stations and playlists based on songs similar to any given song. To top it all off, there's a widget-sized packaged app that can stay on top of all other windows and shows you the song that's playing and gives you control over playback. It's really a full-featured music app available right on the Web and works perfectly with a Chromebook. And if you want to watch movies, there's Google Play Movies & TV which is a great packaged app that has a whole world of movies and TV episodes available for purchase. Both Music and Movies & TV have Chromecast options so you don't have to listen to/watch your media on your Chromebook if you don't want to. It'll cast right to your TV screen. Here we have a really cool app that works great, but just has one serious limitation. Audiotool is a free web app that offers a full range of audio production tools including mixers and synthesizers and sequencers galore! You can record your own audio, or choose from samples in their library. There are plenty of tutorials available to watch, and I highly suggest going through them before getting started in earnest with this app. The one serious limitation is that, at the moment, it only allows you to record your own audio for 30 seconds at a time. So, it's not ideal for recording voice or an instrumental interlude for any greater amount of time. Some people in the Audiotools forum have addressed this, however, so it may change at some point. Or Adobe Premiere, or whatever you use for video editing. WeVideo is a great application for creating professional-looking video on a familiar interface that works with Google Drive. They have three interface versions, one for whatever level of experience you have: Storyboard, Timeline, and Advanced. They also have free soundtracks and sound effects, text overlays, transitions, and whatever else you may need to make your movie. When it comes to exporting your video, they have a free option, but if you want higher quality or to export to more services, you'll have to pay. Right now, their fully-featured offering is available as a Web app, but they do also have WeVideo Next which is a packaged app that seems to be in the experimental phase and only has the Storyboard interface for now. It'll be exciting to see that evolve into a regular Final Cut competitor! So there's a basic list of apps that may convince you that you're not missing out on anything by getting a Chromebook. The world of computing is slowly, but surely, moving toward the Internet, and I, for one, welcome our Web-crawling overlords. If you're looking for an alternative to any other app, just do a quick search through the Chrome Web Store and I'm sure you'll find something that suits your fancy. Next time, I'll take you on a tour around the Chrome OS interface so you can see what I mean when I say that Google Drive is baked into it. Until then, keep playing around!